We hope you enjoy the drive to our farm. We're conveniently located near Fayetteville and Raleigh, North Carolina. Once you arrive, get ready for loads of fun! 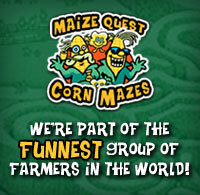 Check out our Giant Corn Maze and attractions!